The EDS 3300 is a compact electronic pressure switch with an integrated digital display. 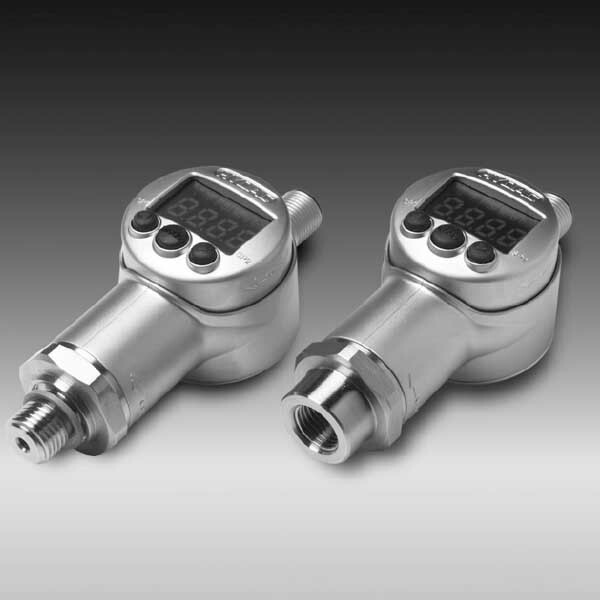 It serves for relative pressure measurement in the low-pressure range. It also has a ceramic measuring cell with a thick-film strain gauge. The instrument can also have one or two switching outputs. What’s more, there is the option of an additional switchable analogue output signal (4 .. 20 mA or 0 .. 10 V). Note that a special design feature of the EDS 3300 makes it possible to move the display in two planes (axes). Moreover, the installation of the instrument can be in almost any mounting position. Plus, it’s possible to turn the display to the optimum position without the usual additional expense of a mechanical adapter. This 4-digit display can indicate the pressure in bar, psi or MPa. It is, therefore, possible for the user to select any particular unit of measurement. When changing to a different measurement unit, the instrument automatically converts all the switching settings to the new unit of measurement. In addition, the EDS 3300 is also available in a DESINA®-compliant version. The main applications are primarily in hydraulics and pneumatics, as well as in refrigeration and air conditioning technology.